One thing I find disturbing about Republicans is how they can’t let their hate for Hillary Clinton go away. Think about it: After Barack Obama beat John McCain and Mitt Romney, liberals basically forgot about the two defeated Republicans and moved on. But since Republicans apparently believe that hate is a Christian value, they just can’t let Hillary go. And Trump isn’t the only one. 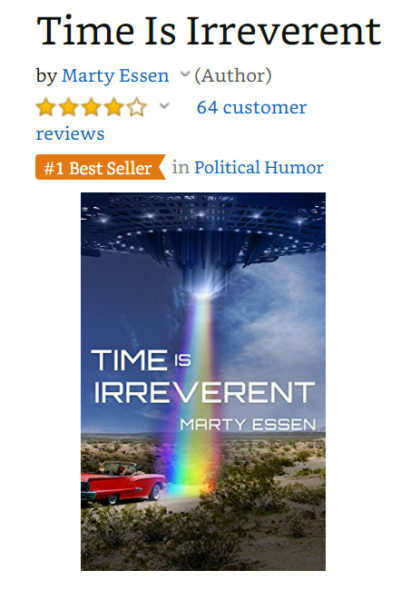 This morning I was excited because my novel, Time Is Irreverent, knocked Fox News host Tucker Carlson’s new book out of the #1 slot in Political Humor on Amazon. Since the weeklong special I’m running has my book selling like hotcakes, I thought it would be there for the duration. Then, after being at #1 for roughly 10 hours, an anti-Hillary book knocked me to #2. That book, What Really Happened: Facing the Facts on Clintonian Propaganda, by Dr. Ann Noni Moose (obviously a fake name) came out of nowhere. I researched to find out how a book with only three reviews could do that and learned that the conservative Daily Wire posted a story about the book (I bet they wrote the book too) and sent a plethora of Clinton haters to Amazon to buy it. Fortunately, Amazon algorithms are skeptical of books with flash in the pan sales. My guess is that once the Daily Wire article gets buried below newer articles, my book—which has months of consistent sales—will bury the Clinton hate book as well. If you’d like to help me knock yet another hate-filled conservative book out of a #1 slot, please click this link and take advantage of my one weeklong super special.